The difference between them is the area they enclose. Inlays are more like fillings but they are located between cusps on the chewing surface of the teeth. On the other hand, onlays are prepared to enclose one or more cusps. 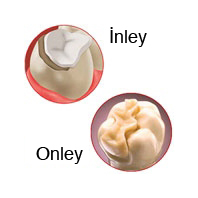 Inlays and onlays are made of either ceramic or composite which is reinforced with fiber. Suitable material is chosen considering the opposing teeth which may be natural, composite, or porcelain. Usually, after decay is cleaned from teeth, which had root canal treatment or which excessively decayed, inadequate hard tooth tissue is left. This makes the connection between neighboring teeth impossible. If there is no connection between neighboring teeth, the food you eat is easily accumulated in between and causes gingival problems. Because inlays and onlays are prepared on models, intended anatomic structure and connection can be made easily. Moreover, they are more resistant to corrosion and chewing pressure than standard filling material. How long are inlays and onlays’ lifespan? Lifespan of inlays and onlays depends on the material they are made of, the condition of the tooth to which they are applied, chewing forces, how careful the patient is with his oral care and regular dentist appointments. They usually healthily function for decades. After they are prepared in the laboratory, inlays and onlays can be completed in 2 appointments. Remaining healthy tooth tissue enables dentist to decide on which teeth inlay or onlay will be applied. At the first appointment, the cavity is cleaned and the measurements of the prepared tooth, neighboring and opposing teeth are taken. The tooth is sealed with temporary filling material. The measurements are sent to the laboratory. At the second appointment, temporary filling is removed. Prepared artificial tooth is tried on and it is sent to the laboratory to be polished. At the same time the natural tooth is cleaned. Inlays or onlays are cemented to the teeth with a special adhesive. Closure is precisely adjusted by the dentist and inlays and onlays are polished. It takes 2 hours for adhesive to be complete. Drinking anything is allowed but eating is unfavorable within these 2 hours. What should be taken into account in daily life? Only regular oral care is required which involves brushing the teeth, using dental floss, and regular visits to the dentist for inlay and onlay maintenance. What are the advantages of porcelain inlays and onlays? They are aesthetic and long-lasting. They protect the remaining hard tooth tissue. Corner overflow and the risk of new decays are minimal. Their adaptations to tooth restoration are supersensitive. Inlays and onlays might not be completely attached if they come into contact with saliva. The dentist should meticulously check humidity. Porcelain inlays and onlays may also be broken.